I was thinking of breaking with tradition and using a rice/beef mince/tomato/herb/. and touch of cheese mix to stuff my Anaheims. What do you think? Or have you any other low-fat, not too carb heavy, combos for stuffing Anaheims? I'm not being too extreme, just been a big Xmas. I haven't tried this myself but we have a friend who uses sort of a deviled crab type mixture with some cheese and a filling, then deep fries them, but of course you could put them in the oven instead. Stuff peppers in a bottle or jar or bottle. add approx 1 heaping teaspoon pickling salt per pint. Boil 5% apple cider vinegar and pour over peppers. Close tightly but does not need to be sealed as in canning does. Let me add use proper pepper procedure, gloves eye protection and vent. I wanted to say that we DO not eat the Habaneros we just use the vinegar. Thanks for the recipe. Have you tried this with other kinds of hot peppers? The recipe written by Dh's Dad actually says hot peppers. I am sure you can use others we just like the flavor of the Habaneros. It's done the same way in SG, South Georgia. :-) And used on the same stuff and etc. You can also can hot banana peppers this way and the peppers are great to eat after they sit for several months. I've never seen the plastic mason jar lids. Is that something new that they came out with. I guess you could only use them for icebox canning but they would work great for that. I haven't seen them in the stores down here. Super Walmart in the canning section. Can kosher salt be substituted for canning salt? Kosher salt is the same thing as canning salt. The difference between the two and regular table salt is that no iodine is added. All table salt has iodine and that doesn't interact with the canning process well, hence some being labelled "canning salt". I find that natural sea salt is ok to use in pickling/canning too. There may be trace amounts of naturally occuring iodine but its no miniscule an amount that it doesn't cause any problems in my experience. If you like a hot bbq sauce and your sauce has a vinegar base to it, you may like to add some of those pickled habaneros directly to it, minced up. Yummmmmm. My taste buds are watering at the thought. (Although, I should think that even if it doesn't have a vinegar base to it, you might still add them. I would....hot peppers are always good. 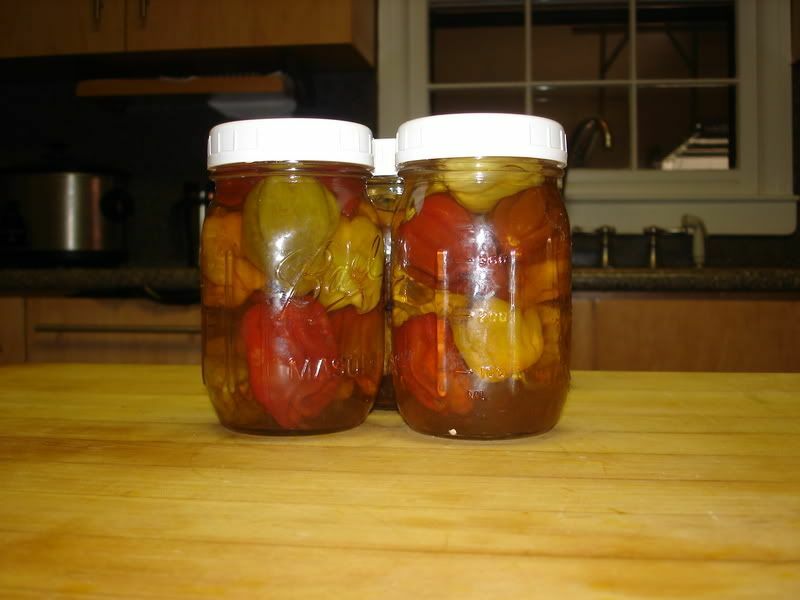 I grew up scarfing down pickled scotch bonnets when visiting relatives in Jamaica. Needless to say, my idea of "heat" isn't what most Canucks prefer or want. LOL). Kosher salt also is preferred over table salt for canning and pickling. Like pickling salt, kosher salt is free of iodine, which can react adversely with certain foods. Some brands of kosher salt contain yellow prussiate of soda, an anti-caking agent, but unlike the anti-caking additive in table salt, it doesn't cloud pickling liquids. The only drawback to using kosher salt for pickling or canning is that the grains are coarser and flakier, and can't be packed as tightly into a measuring cup as pickling salt. This raises the risk that the salt won't be properly measured. To get around this problem, measure by weight instead of volume. With its large grains, kosher salt isn't a good choice for baking. I stuffed the jar with Hungarian Hot Wax and poured the liquid into the jar. Tried one the next day, I think its a keeper. Next time, I may use some honey instead of sugar, and, I'll definitely add garlic.